Popular social media personality and veteran radio host Mark Lopez burned down Sen. Kiko Pangilinan for defending the deported Australian nun despite it's violations of Philippine immigration laws. Sen. Kiko Pangilinan took to Twitter as he criticized the Duterte administration for deporting Australian nun Sister Patricia Fox. Pangilinan tweeted "Deporting a 70 year old, ailing nunis not a sign a of power and strength. It is a sign of great fear, of cowardice and of weakness." He also added a link to an article posted by Inquirer. The statement of Sen. Kiko Pangilinan caught the attentions of Makr Lopez who burned down the senator on social media. 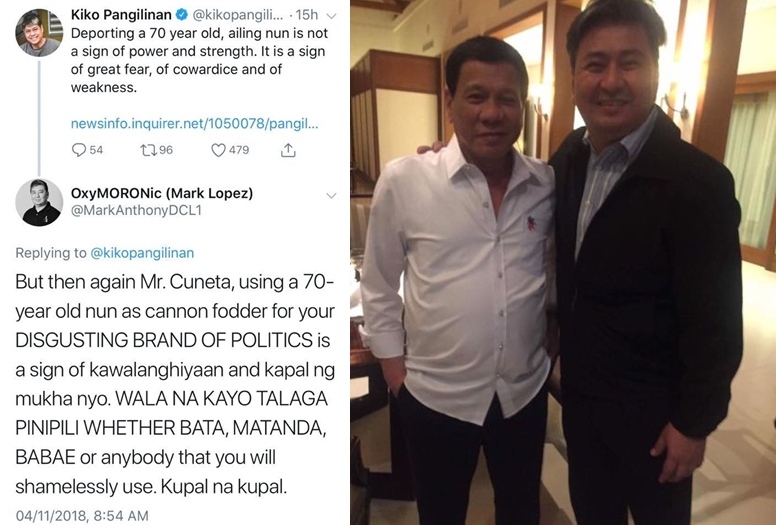 "But then again Mr. Cuneta, using a 70-year-old nun as cannon fodder for your DISGUSTING BRAND OF POLITICS is a sign of kwalanghiyaan and kapal ng mukha nyo. WALA NA KAYO TALAGA PINIPILI WHETHER BATA, MATANDA, BABAE or anybody that you will shamelessly use. Kupal na kupal." Netizens also joined the bandwagon of criticizing Sen. Pangilinan who lambasted the decision of the Duterte administrtaion to deport the overstaying nun for violating immigration laws and joining various rallies against the government. Edgar Jordan: Using a nun to fight your own battles looks more cowardly to me. Edgardo J. T. Tirona: Correct! They shamelessly manipulated the old nun for their political interests. Celmar Libran: The Good Sister's acts overseas has put her in the bad books in Australia. Australians overseas are strongly discouraged from interfering or participating in their host country's current state of affairs. She is welcome to assist with her order's mission and not go over and beyond her call of duty. It comes as no surprise the Jaundiced Cult will sensationalise this issue to pursue their nefarious goals. Crying shame. Carmelita Orlena Exactly Sir Mark! The nerve of eyebags saying those things!